Was my favourite part of the movie! Too cute! Oh! a green troll, I know some little people who will love this one! thanks! Hehe...the little romance rock troll is too cute. He's just a bit of a fixer upper! Oh my!! This blog hop was WAAAYYYYYY too short....lol! Great job!! LOVE LOVE this troll!!!! So sweet! Cute any little monster (child) would love this card. I love the trolls! Great job! Who knew a troll could look so so cute, love him. thankyou. I love the trolls! They often get forgotten for sure. Your card turned out great. Love the sequins detail you used. Glad the love Dr's weren't forgotten. Love this thank you for all your hard work. haha.......LOVE the troll! so cute! thanks for sharing your project! Love the card. Great hop. The troll part in the movie is one of my favorite scenes. Love it when they are singing. Glad to see a troll file included. Love your troll. He is great. Great Card Candice, you girls do a great job and ANn is Amazing! Who doesn't love a cute troll! Nice job. Fantastic card! Love the troll - and your detailing is wonderful! This is the best! I love the trolls! Heehehee your troll is oo cute. Love your choice of card base. Love that you did one of the trolls. Awesome!!! If a troll can be cute, he is! Thank you! What an adorable card -- your troll is too cute!! too cute! Love that troll! awesome way to end the blog hop! I love all the characters but it's nice to see the trolls :) Love this! Yes he is very cute. Love it. I love your Troll! and love the green cape. I love him!!! so fun! Great job on the troll! Very fun hop once again!!! Love it!!! Great ending to the hop. I love the trolls and yours is adorable! Love the shading on the Troll. He's gorgeous. LOVE that awesome troll!!! He is too cute!!! AWESOME job and such a fun hop! Love the troll. Thanks for sharing. Perfect for all the little boy birthdays coming up! OMG! The rock troll. So cute, and the sentiment is so perfect for him. This was such a fun hop! The troll is awesome!! So many places we an use him!! Thanks! Oh this is great. Love that sentiment - so perfect for this little guy. I love that you made the troll!!! Awesome hop!!! aww this little guy is so cute,. Job Candace!!! Love your troll! Troll is sooo cute! Great finale for an awesome hop! So cute! The sentiment goes so well. It's different of what I could expect, but in a good way. Thanks for depicting the most important characters. He came out super cute! Love it - he is super cute! YOUR CUTE IM GONNA KEEP YOU!!!! Love your project. Made me smile. Awesome. I love card shape, colors, patterned paper and the image! My favorite project. The troll is so adorable!!! Lots of great projects!Love the hop. Love the troll. Great job. YES! I love the trolls! And you did an awesome Job he is so cute! perfect!!! love the card and the sequins!!! fabulous job! Super cute! Another amazing hop! Oh my gosh! I love the troll!! Too cute! Love it! And the sentiment is perfect! Thanks again for a wonderful hop!!! Love the Troll! Very cute. I was hoping someone would do a troll. Love it. So glad you used the troll, you've done him justice - love it. What a cute troll! Love this project! Super cute! Love all the projects! This is so cute. Love Grampa Troll. TFS. What a great card. TFS!!!! How adorable! Thanks for this great hop!! He's adorable! Just love him! So glad you did a troll!!! I love them! The trolls were so funny--great card. I like the sequins. Love the troll. The colors are amazing. Ha ha. I love the troll card. It's great. Thank you. So cute. Those trolls make me laugh. I love trolls… he is just awesome!! OMG, this troll is just too adorable and what a perfect sentiment. He is adorable. Love all the layers to him and your highlighting that really makes him stand out. I was hoping to see a troll! super job! This card is adorable! Love it! Wonderful hop ladies! Love the troll!! Adorable card! Your card makes me smile... and a little giggle ;) Very cute Candace!! OHHHH I was so hoping someone would do one of the rock people. Thank you so much for sharing with us. Your hops are awesome! I would never miss one! He is so cute! Thank you for all the awesome files, following all the new blogs. Loved the playfulness of the trolls. The troll is so cute, thanks for sharing! I knew it!! You saved the best for last!! LOVE this file!! LOVE THIS CARD!!! Another one for my Pinterest page! Great job! 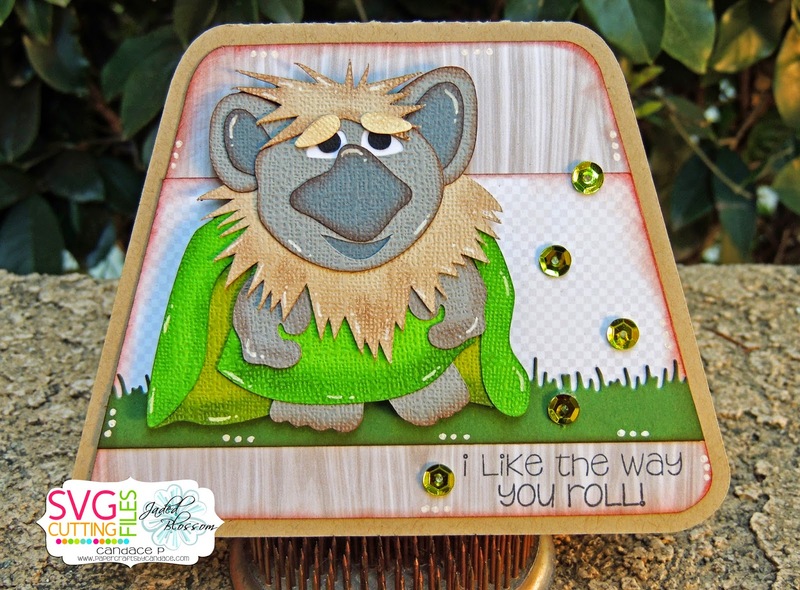 Love your Troll card, too cute! Awwwwwwwwww it's Pabbie! "The heart is not so easily changed, but the head can be persuaded." Tots adorbs! Yay! I was hoping for a troll!! So fun! You did a fabulous job!! Love him! OH a troll!! I have this movie and so need to watch it. I've seen the characters all over the place. This is my granddaughter's favorite movie. He's such a cute troll. loving the troll! super cute! I'm glad the Troll is in the hop, they r so cute. I can hear them singing, "Fixer Upper" I have loved this hop!! OMGEEE!!! LOVE HIM!!! Those rock people are so funny! Great job! And thanks for an AMAZING hop! !